Staff very friendly and helpful. My husband was ill and they were understanding and accommodated our need to have our half board evening meal in our room. Next time I stay I will request a superior room with a door looking out to the sea instead of a round window one. The photos don't do this hotel justice. Nicely renovated, very clean, excellent facilities, secure underground parking (13 Euros per night), bar, restaurant, very friendly staff and 5-10 minutes walk in to the centre of Biarritz. Really enjoyed our 4 nights there and Biarittz is a fantastic City with great restaurants, wonderful shops and very clean. Where to find Biarritz hotels near an airport? How can I find hotels in different Biarritz neighborhoods? Where can I find hotels in Biarritz that are near tourist attractions? If you are looking for upscale or budget hotel establishments in or around Biarritz, it's comforting to know that there is a wide range of possibilities. Expedia's extensive and up-to-date database lists 90 hotel options within a 0.1-kilometre (0.06-mile) distance of Biarritz's central area. The most centrally located hotels of downtown Biarritz are the Hôtel du Palais Imperial Resort & Spa and Sofitel Biarritz Le Miramar Thalassa Sea & Spa. Accommodation close to the Cote des Basques include the Beaumanoir Small Luxury Boutique Hotel and the Radisson Blu Hotel, Biarritz. 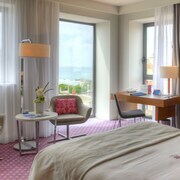 The Hotel Le Café de Paris and Hotel de Silhouette are conveniently positioned near the Anglet Beach. The Biarritz Casino and the Grand Beach are two other often-visited Biarritz attractions. The Hotel le Windsor Grande Plage Biarritz and the Le Regina Biarritz Hotel & Spa MGallery by Sofitel are near to the Biarritz Casino. The Hôtel Villa Koegui and the Hôtel St-Julien, are close to the Grand Beach. Families, students and shoe-string travelers can choose from great Biarritz accommodation options that definitely won't that won't make the bank manager's jaw drop. 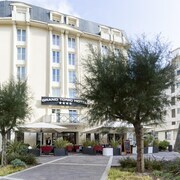 0.2 kilometres (0.1 miles) away from Biarritz's heart is where you'll find the Mercure Le President Biarritz Centre. The Hotel Florida is only 0.2 kilometres (0.2 miles) away. Alternative budget hotels include the Best Western Plus Karitza and the Hôtel Georges VI. The Relais & Châteaux Hôtel Parc Victoria is situated 12 kilometres (8 miles) from the middle of Biarritz. Another accommodation option is the Grand Hôtel Thalasso et Spa, which is located 13 kilometres (8 miles) away. Some more options in the area include the Les Hortensias Du Lac and the Parador de Hondarribia. Looking for more to do? Consider spending some time exploring Joanoenia: Maison de l'Infante and Eglise Saint-Jean-Baptiste, which you'll find in Saint-Jean-de-Luz City Center, 13 kilometres (8 miles) to the southwest of Biarritz. Should you wish to stay in Saint-Jean-de-Luz City Center, check out the room rates at the Résidence La Reserve and Hôtel Hélianthal. 14 kilometres (9 miles) to the southwest of Biarritz, you may also choose to stay at Ciboure, home to the Hôtel La Réserve and La Marisa. The Nivelle Golf Course and Lafitenia Beach are just a couple of the more popular sites to see in Ciboure. 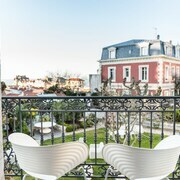 If you are traveling into or out of Biarritz - Anglet - Bayonne Airport and are looking to stay nearby try Château de Brindos or Biarritz Océan Résidence Hôtelière. What are the most popular Biarritz hotels? 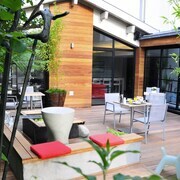 Are there hotels in other cities near Biarritz? 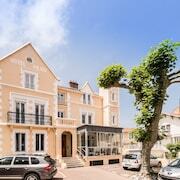 What other types of accommodations are available in Biarritz? Explore Biarritz with Expedia.ca’s Travel Guides to find the best flights, cars, holiday packages and more!